Wow, this is fun digging through old race pics. Here we have the McLaren F1 GTR #020R-BMW V12 powered machine that raced for the first and only time in the US during the Octoberfest FIA GT Championship on October 18, 1997. The race was a 3 hour enduro. 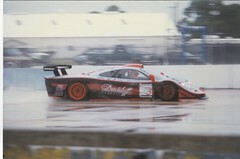 This event was historical as it was the first time many of the FIA GT cars raced in the US. This team was sponsored by Gulf Team Davidoff (GB) . This car was driven by Pierre-Henri Raphanel (F)/Jean-Marc Gounon (F), and finished 5th (2 laps behind the winner). I remember this race well because it rained the entire time. It was still great seeing these awesome machines zipping by, shooting up their rooster tails. I'll keep posting pics of this event to show off some of the other great cars that participated.